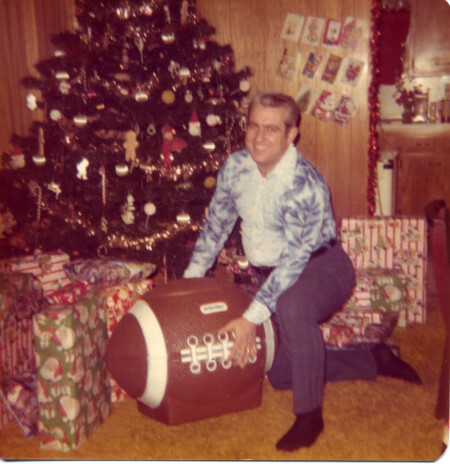 The Little Tikes football toy chest was a popular gift in the 1970s. That pic you see is of my Dad, circa 1977 I believe, with one of the iconic kids’ products of my generation. Yep, when I was growing up, I knew at least a dozen kids who all had that same, huge football-shaped toy chest, and three decades plus later, I’m not ashamed to say that I wish I still had it. Because we all have toys, you and I, only now, they’re probably not made by Fischer Price or MECO or Milton Bradley. But if I still had one of these babies, I can just imagine which of my current-day belongings would be stored inside. My three-ring binder full of guitar tabs? Yup. My extra picks, pitch pipe, backup strings and oil for cleaning my fretboard? Oh, heck yeah. My MP3 player, which is still hanging in there and which I use to play audio books while I’m out in the garage on the treadmill? Of course. Those things, and no doubt, dozens of treasures more. I came downstairs to open presents one Christmas, and this monster was sitting there by the tree, waiting for me. I was maybe eight years old, and I could take the lid off and actually sit inside the thing. Don’t lie—I’m betting if you had one, you did, too. Like most kids did, you probably multi-purposed the heck out of it. Because, it wasn’t just a football. It was a race car. It was a space ship. It was a place to crawl into and get out of sight when you were playing hide and seek with visiting cousins—who didn’t know you’d already emptied it just so you could jump out and scare the daylights out of ‘em. Later, when I was in junior high, and as my toy collection dwindled, it held my baseball equipment. My catcher’s gear, during one particularly miserable little league season. After that, it held my early hockey gear. My Mylec helmet. My CCM hockey pants. My Bauer Turbo roller skates. It didn’t make it to see my college knickknacks or my ice hockey equipment, but through no fault of its own. That bad-boy was durable, and then some. We sold it at a garage sale about the time I turned 15, and I was a little sorry to see it go, even though it no longer fit my room or had much of a use for my things. Still, like a first bicycle, pinewood derby race car or first model kit, that football toy chest was a fixture in my room for the better part of a decade.